The question What is consciousness? is about one of the central problems of philosophy, maybe even the central philosophical problem. It is about the human nature. Who am I? What is the I, the subject? What is its ontological status? Wherein does its identity consist? How is its role in connection with the question of personal identity or rather the criteria for personal identity? It is a problem which is related to a number of other philosophical problems, for example the psycho-physical problem (mind-body problem), the problem of the external world, the idealism-materialism problem and the problem about determinism contra free will. But it has also connection to psychology, for example to the problem of multiple personalities, and to law and ethics. In what sense can a person be made responsible for a crime, which lies behind him in the past? Anyone changes with time, some in a high degree, others little, new experiences are coming, some viewpoints are being changed, etc. Is there anything constant in a course of life? If yes, what does it then consist of? If no, when has a person then changed so much that he can´t be made responsible for a previous committed crime? And the problem has of course also a relevance for religious viewpoints. If you believe in a life after death, disembodied, or reincarnated, then an articulation of this faith must give an explanation of what consciousness is, what ontological status it has. You can´t be a materialist and at the same time believe in a life after death. Furthermore: it has an implication on the concept of meditation, which per definition is training of consciousness, and a rediscovery of the nature of consciousness, a complete consciousness. The problem is as old as philosophy itself. You could mention the famous dialogue between King Milinda and Nagasena, a classic in Buddhist philosophy, and in the Upanishads, an even older account of Indian philosophy. We meet the problem in the Orphic philosophy in ancient Greece and in Plato´s philosophy. Even if it is underexposed as an independent problem, a problem in its own condition, in the Hellenistic time and in both the “dark” and “light” Middle ages, then the problem is continually central in the philosophical and theological thinking. With Descartes it gets a sharp profiling and since his time the philosophical market has been flooded with suggestions of the solution of the problem, or rather, its resolution. For some reason most people today are reductionists, and hate the thought that consciousness could have a special ontological status, despite that this opens ups for an enchanted world. So, there are two fundamental viewpoints in relation to the problem of consciousness, namely a reductionist and a non-reductionist. Through history we know reductionism from, among others, materialism, according to which all phenomena of consciousness, such as the sense of an I, which chains these phenomena of consciousness together, are purely illusionary, either an epiphenomenon or something completely non-existent. But reductionism doesn´t necessarily imply a denial of the existence of consciousness phenomena. There are versions of reductionism, as for example Derek Parfit´s, according to whom a person is to understand as a physical existence, a series of bodily states, to which is connected a series of mental states. But there isn´t anymore to it. The “I” itself is – with an expression of Arthur Koestler – a grammatical fiction. The viewpoint has roots back to for example Locke and Hume, who in this matter represents an opposition to for example Descartes and Leibniz. In the latter you can find the non-reductionist line to which I myself belong, though I in other matters highly disagree with Descartes (it is important to know that Descartes not is a reductionist when it comes to mind). A part of the concept of consciousness I will explain in the following is inspired by my teacher in philosophy of mind, the late Erich Klawonn, who was a sharp critic of reductionism. Klawonn began his lectures with a short passage from Hume´s Treatise of Human Nature, where it is established, that it is impossible to form an idea about a permanent I or self. And now comes something, which Klawonn is quite unique in pointing out, and that is, that the analysis which Hume carried out, always must be carried out in a first-personal perspective, and that there therefore always must be a primary presence, which seems to be the experience of “me-ness” and therewith the permanence, which Hume was asking for. This primary presence is so self-evident, that one begins to wonder how Hume, and with him, other reductionists, completely can overlook it. It is common sense to all of us, that we have had the same me-ness, or primary presence since childhood. This primary presence had been permanent present in all the years that has passed. It is logically impossible to get around with, except in explaining away. I have called this first-personal, primary presence, for the inside-and-out-perspective. Everything we experience, think and do, is carried by this primary presence. The content might change, but not the primary presence. When you are reading these lines, you are reading them from a primary presence, a first-personal perspective. It is not another person reading them for you. It is you. But Hume, and the reductionists, examine consciousness from a third-personal perspective, as if it was an object in a scientific experiment. I have called this the outside-and-in perspective (note that when talking about first-personal and third-personal perspectives, Klawonn is not talking about any theory of language). This third-personal way of thinking is in my view something which are unique for Western philosophy, and has probably something to do with the scientific revolution, as well as the complete lack of the tradition of meditation we know from Eastern philosophy. A person who meditates, and has experiences with meditation, will very likely find it impossible to think of consciousness from a third-personal perspective. But that is what most Western philosophers do. And Western philosophy is in my view a part of the decline of philosophy. Intriguingly, if you read science fiction writers like Stanislaw Lem, Isaac Asimov, Arthur C. Clarke, and Robert Sawyer, you are already aware that some of the best science fiction tales are in fact long versions of philosophical thought experiments. From Arthur C. Clarke´s 2001: A Space Odyssey, which explored the twin ideas of intelligent design and artificial intelligence gone awry, to the Matrix films, which were partly inspired by Plato´s Cave [note: among many others, they were also inspired by Descartes, the dream-hypothesis, and later, the brain-in-jar hypothesis], philosophy and science fiction are converging upon a set of issues in science fiction that are philosophical intriguing. It is thus my modest hope that this short book isolates a number of key areas in philosophy where the interplay between philosophy and science fiction is especially rich. For instance, you might have seen the films AI or I, robot (or you may have read the stories they are derived from). An you might have asked: Can robots be conscious? Should they have rights? Is artificial intelligence that is smarter than us even possible? Or you might have read a time travel story, such as H.G. Well´s The Time Machine, and asked: Is time travel possible? Indeed, what is the nature of space and time? The book delves into these questions, as well as many others, such as: Could I be deceived by the external world, as in The Matrix, or Vanilla Sky? What is the nature of persons? For instance, can my mind survive the death of my body? Can I “upload” my memories into a computer and somehow survive (as in the film Transcendence and the novel Mindscan)? Do we ever act freely, or is everything predetermined? (e.g. Minority Report). Should we enhance our brains, and even change our very nature? (see for e-g. the cyberpunk genre). As you can see, all these questions are related to philosophy of mind. There are pro and cons in these questions. It is from the third-personal perspective we for example have the thought experiments about how the consciousness under certain conditions either can be split in two or more or be doubled (Before we go any further you should note that many of the reductionists also talk about the first-personal and third-personal perspective, but they haven´t grasped Klawonn´s conception of the primary presence´s logic, and end up in the third-personal perspective, whereby they can deduce their absurd conclusions, such as mind-uploading to a computer. I will explain this in the following). One of the thought experiments is the concept of the split-brain, which Roger Sperry came up with. It says that a cut of the nerve connection between the two brain-hemispheres would cause two separate consciousnesses, with each their own sensations, act-impulses and memory-chains. You could in fact think this to be the case if you use a third-personal perspective, but not if you see it from your own primary presence: the first-personal perspective. All reductionists who discusses the split-brain thought experiment, commits the mistake of discussing the thought experiment in a third-personal perspective (even if they mention the first-personal perspective), and end in reductionist conclusions; that is: they are explaining consciousness away. What Klawonn emphasizes is that you bring yourself into the discussion, and are trying to see the questions from your own primary presence. The same mistake is happening when reductionists are discussing the Teletransportation Paradox. The Teletransportation Paradox is a thought experiment on the philosophy of identity that challenges common intuitions on the nature of self and consciousness. It first appeared in full published form presumably in Derek Parfit's 1984 book Reasons and Persons, but similar questions have been raised as early as 1775. The Polish science-fiction writer Stanisław Lem discovered the same problem independently in the middle of the twentieth century. He put it in writing in his philosophical text "Dialogi", 1957. Also Derek Parfit is into science fiction, especially Stark Trek, which is known for the use of the Transporter, which is a fictional teleportation machine. Transporters convert a person or object into an energy pattern (a process called dematerialization), then "beam" it to a target, where it is reconverted into matter (rematerialization). The term "transporter accident" is a catch-all term for when a person or object does not rematerialize correctly. In Divided Minds and the Nature of Persons (1987), Parfit asks the reader to imagine entering a "teletransporter", a machine that puts you to sleep, then destroys you, breaking you down into atoms, copying the information and relaying it to Mars at the speed of light. On Mars, another machine re-creates you (from local stores of carbon, hydrogen, and so on), each atom in exactly the same relative position. Parfit poses the question of whether or not the teletransporter is a method of travel—is the person on Mars the same person as the person who entered the teletransporter on Earth? Certainly, when waking up on Mars, you would feel like being you, you would remember entering the teletransporter in order to travel to Mars, you would even feel the cut on your upper lip from shaving this morning. Then the teleporter is upgraded. The teletransporter on Earth is modified to not destroy the person who enters it, but instead it can simply make infinite replicas, all of whom would claim to remember entering the teletransporter on Earth in the first place. Using thought experiments such as these, Parfit argues that any criteria we attempt to use to determine sameness of person will be lacking, because there is no further fact. What matters, to Parfit, is simply "Relation R", psychological connectedness, including memory, personality, and so on. Parfit continues this logic to establish a new context for morality and social control. He cites that it is morally wrong for one person to harm or interfere with another person and it is incumbent on society to protect individuals from such transgressions. That accepted, it is a short extrapolation to conclude that it is also incumbent on society to protect an individual's "Future Self" from such transgressions; tobacco use could be classified as an abuse of a Future Self's right to a healthy existence. Parfit resolves the logic to reach this conclusion, which appears to justify incursion into personal freedoms, but he does not explicitly endorse such invasive control. Parfit's conclusion is similar to David Hume's view and, as some claim, also to the view of the self in Buddhism, though it does not restrict itself to a mere reformulation of them. For besides being reductive, Parfit's view is also deflationary: in the end, "what matters" is not personal identity, but rather mental continuity and connectedness. Before we proceed, I need to clarify that the question of the Buddhist denial of a constant self has nothing to do with Hume, or any kind of Western materialism and/or idealism, since these only work with the ordinary mind, and not the consciousness in the form of primary presence, as I will present in the following. Should it be possible once to make a copy of a person´s whole atomic build up and therewith – if you are assuming a complete psycho-physical parallelism – of its complete content of consciousness, inclusive all its memories, unconscious complexes, etc., then you can, for example, imagine that you make two copies and kills the original and then the question becomes: which of the two copies can be assumed to be identical with the original: is it A or B or both or none of them? Parfit´s analyses of such questions end in absurd conclusions, because he is discussing the whole thing in a third-personal perspective. I must admit that I find it puzzling that Western philosophers can be so detached from their own primary presence that they can make up such complex and absurd theories, without even considered the self-evident fact that they themselves always are in the primary presence. When you namely look at all this in a first-personal perspective, another question will always pop up, and that is where my primary presence is thought to be placed, because with this place the identity is established. Klawonn used these thought experiments in order to distinguish the primary presence as something different from both the body and the person´s mental properties. The physical or mental aspect of a person is not the same as this person´s primary presence, since you can be a witness to them both. This witness is a negation of both mind and body. This, to be me, can not at all be conceived to be a property of a person or a thing in the world. When using a third-personal perspective you can without contradiction, think, that you can move around with this primary presence as an object, as for example when you are teletransporting a person from one place to another, and where there can happen a technical accident which causes that there suddenly exist two versions of the same person, one in place A, and one in place B. But when using the first-personal perspective, you can´t think logically, that the primary presence can be at two different places at the same time. It is the concept of the primary presence as something else than both matter and mind, that makes Klawonn unique. I have adopted this concept myself. And I have developed it further into my own double-aspect theory, which I will return to. When you today ask what a human being is, you will therefore very seldom hear that the nature of Man consists in something universal (metaphysical), as for example oneness with the divine, the ultimate fulfilment, the essence of consciousness, the naked consciousness, the enlightened consciousness, the source of love, etc. Instead you often the expression that Man is a product of heredity and environment, something particular, or the content of mind (psychology). And the statements are, as the reductionisms they are, avoiding philosophical argumentation and are instead claiming the authority of what science has shown. Is Man only a product of heredity and environment? Has science really proven this assertion? No, it hasn´t. Firstly science till today has not been able to give any explanation of, that we have a consciousness, that we are conscious about ourselves and are able to reflect and meditate over our own wishes, actions and doings. In natural science all explanations are quantitative; that is to say: they are given within the frames of, what can be measured, scaled and counted. It speaks from an outside-and-in perspective on Man; it speaks about the Outer Side of the world, a third-personal perspective. I have always found it weird that philosophers like, for example, Daniel Dennett, can deny the exsistence of consciousness, since it is such an evident daily experience. In his book - with the ambitious title Consciousness Explained – Dennett seeks to explain consciousness, partially through computer analogies, partially through neurology and psychology. So he speaks about consciousness from areas that has nothing whatever to do with our daily experiences. It is called the computational theory of mind. It holds that the human mind is an information processing system and that cognition and consciousness together are a form of computation. Dennett´s position might be called scientific materialism/naturalism. Many current and recent philosophers—e.g., Willard Van Orman Quine, Donald Davidson, and Jerry Fodor—operate within a broadly physicalist or materialist framework, producing rival accounts of how best to accommodate mind, including functionalism, anomalous monism, identity theory, and so on. They all sound very clever, and uses a very difficult language, but the points of views, are in my view, forms of explaining away. These people can refer to an enormous amount of scientific research, indulge themselves in acrobatic explanations, which by first view can impress a lot of people. But already in the starting point they have left the rail and ended up in blind, because they are trying to explain consciousness by explaining something that hasn´t anything at all to do with consciousness, as for example brain complexities and computer complexities. Consciousness has to do with the primary presence, our first-personal qualitative experiences such as pain, sorrow, joy, etc., and you don´t explain these by explaining the connections in a computer. Their books often have almost endless references to literature, which, by a quick overview, are about the same ways of explaining away. In philosophy there is a principle called Occam´s Razor. Suppose there exist two explanations for an occurrence. In this case the one that requires the least speculation is usually better. Another way of saying it is that the more assumptions you have to make, the more unlikely an explanation. Occam´s Razor says shortly: assumptions which don´t explain anything, ought to be cut away from your theories. Occam's razor applies especially in the philosophy of science, but also more generally. ​Much of Dennett's work since the 1990s has been concerned with fleshing out his previous ideas by addressing the same topics from an evolutionary standpoint, from what distinguishes human minds from animal minds (Kinds of Minds), to how free will is compatible with a naturalist view of the world (Freedom Evolves). Just try to say Consciousness Evolves instead, and you´ll have New Age. Dennett sees evolution by natural selection as an algorithmic process (though he spells out that algorithms as simple as long division often incorporate a significant degree of randomness). This idea is in conflict with the evolutionary philosophy of paleontologist Stephen Jay Gould, who preferred to stress the "pluralism" of evolution (i.e., its dependence on many crucial factors, of which natural selection is only one). Dennett's views on evolution are identified as being strongly adaptationist, in line with his theory of the intentional stance, and the evolutionary views of Richard Dawkins. In his book Darwin's Dangerous Idea, Dennett showed himself even more willing than Dawkins to defend adaptationism in print, devoting an entire chapter to a criticism of the ideas of Gould. This stems from Gould's long-running public debate with E. O. Wilson and other evolutionary biologists over human sociobiology and its descendant evolutionary psychology, which Gould and Richard Lewontin opposed, but which Dennett advocated, together with Dawkins and Steven Pinker. Strong disagreements have been launched against Dennett from Gould and his supporters, who allege that Dennett overstated his claims and misrepresented Gould's to reinforce what Gould describes as Dennett's "Darwinian fundamentalism". Dennett´s book Breaking the Spell: Religion as a Natural Phenomena is in the name of science trying to debunk religion and especially the idea of God. But Dennett´s book, like his other books, are unnecessarily lengthy arguments for his relatively simple, and by no means exceptional, ideas of naturalism. Dennett´s belief that science can provide an adequate understanding of religion is obviously not a scientifically proven or even provable claim. It is a dogma, a declaration of faith. No massive accumulation of sarcastic putdowns or intellectual gymnastics can conceal this fact from the critical reader. Furthermore: we have seen how the philosopher Mary Midgley has shown how far from Darwin this kind of atheist fundamentalism is (see my booklet Atheist Fundamentalism). But Dennett represents the most accepted view of human nature today. This ideology is called evolutionism (see my free Ebook Evolutionism – The Red Thread in the Matrix Conspiracy). It is a rather new, European invention, starting with the scientific revolution. It is representing a linear view of history, which breaks with all previous views of history, which were cyclic. I think DNA is ultimately trying to create a world where the imagination is externalized, where the mind and the external world become synchronized as one, so that basically whatever we can imagine can become a reality. Literally. And I think that everything throughout our entire evolution has been moving slowly toward that goal. In the past thousand years, it´s been very steady. And through nanotechnology, through artificial intelligence, through advanced robotics, I think we´re entering into an age where we´ll be able to control matter with our thoughts and actually be able to create anything that our minds can conceive of. We´re very quickly heading into a time where machines are going to be more intelligent than we are, and we´re going to most likely merge, I think, with these intelligent machines and develop capacities and abilities that we can barely imagine right now, such as the ability to self-transform. What we can do with computers – digital technology, the way we can morph things on a computer screen – is the beginning of understanding that that´s how reality itself is organized, that we can do that with physical reality through nanotechnology and artificial intelligence, that the digital nature of reality itself will allow us to externalize whatever we think. So, I think that eventually reality will become like a computer graphic screen, and we´ll be able to create whatever we want. That sound right? David Jay Brown is by no means the only person who are thinking in ways like this. Indeed, his ideas are common in certain very influential parts of America, for example Silicon Valley and the so-called Californian Ideology, and there is in fact a conscious strategy going on, which through technology, internet and social media wants the rest of the world to adapt this way of thinking. "The Californian Ideology" is a 1995 essay by English media theorists Richard Barbrook and Andy Cameron of the University of Westminster. Barbrook describes it as a "critique of dotcom neoliberalism". In the essay, Barbrook and Cameron argue that the rise of networking technologies in Silicon Valley in the 1990s was linked to American neoliberalism and a paradoxical hybridization of beliefs from the political left and right in the form of hopeful technological determinism. We have already seen how Oprah Winfrey also is thinking in this American Dream about create-your-own-reality (see my articles The Psychedelic Renaissance and David Jay Brown and Oprah Winfrey). What to me is most scary about The Californian Ideology is that it in fact supports the machines in the movie The Matrix, and thereby confirms everything I claim about the Matrix Conspiracy. It finds it desirable that humans should be treated as batteries for machines, by inducing them a virtual reality. They happily talk about mind uploading to computers, and brain emulation (besides my ebook on evolutionism, see my article Simulation Theory, as well as my critical articles on Facebook Is Facebook a Matrix Machine? And The Return of the Sophists. For an updated explanation of my concept of the Matrix Conspiracy, see my article The Matrix Conspiracy Updates). The Californian Ideology is an ideology which is seeing human beings exclusively from a third-personal point of view. It is also a view which exlusively works with the content of mind, a psychological reductionism. But when we speak about everything, that the word consciousness covers – thoughts, feelings, considerations, pains etc. – then it seems quite clear, that it is not something that is quantitative. When we are using an inside-and-out perspective (speaking from the Inner Side of the world, the primary presence) and describe our states of consciousness and our experiences of, what we think is beautiful, ugly, attractive, repelling etc., - then we use a completely other language than the quantitative language of natural science. So how should one be able to reduce everything to natural science or psychology? For some weird (unreasoned) reason this self-evident fact is impossible for certain materialists to understand. They are arrogantly convinced about their scientific truth, but can neither prove it, or argue reasonable for it. As an example, let us begin, quite literally with the matter with which The Lord of the Rings deals. Regarded from the outside-and-in perspective (the Outer Side of the book) this book is a material body in space. It can also be understood as a vibrating energetic structure. The book´s three-dimensional form, however, conceals a multi-dimensional inner world of meaning (the Inner Side of the book). We cannot enter this world by researching the fabric of space and time, matter and energy. We can only enter it by reading the book! Surprise, surprise, to materialists, who quite possible haven´t read The Lord of the Rings. But they have read other books, and they can´t deny that they needed to read them in order to reach the inner world of meaning (that is: the Inner Side of the books). We can only enter The Lord of the Rings by reading the book – letting our awareness flow into its inner soul-space – a space that derives from the unique soul qualities and constitute the spirit of another being – its author. The world of soul is a world of meaning. The world of spirit, a world of beings. But to convince the modern materialists of the existence of an invisible world of soul and spirit, however, is like trying to convince someone who doesn´t know what it means to read, that the invisible ink marks on the pages of a book conceal an invisible world of meaning and are the work of an invisible being – one nowhere to be found in the matter or energy of the book. The interesting is however, that the more science develops, the more you have to give up backgrounds, which once occured evident to everyone. In nuclear physics and the quantum mechanics we have learned, that there exist processes, which is not cause determined, and which do not follow the old rule about, that everything has to be continuous. Brain-functions are in a wide extent quantum mechanical, and since the quantum mechanics breaks with the principle of causation and determinism, then the human brain is not fully a cause determined system. And then you can´t up from the ground explain brain processes from genetical and environmental factors. The fundamental principles of classical physics, namely the perception of space and time as absolute and the principles of causality, determinism and continuity, must therefore be completely given up with the breakthrough of modern physics at the beginning of this century. The only exception is the principle that energy and matter are constant, which also in modern natural science is considered to be fundamental. Note, that Bohr here speaks about the usual language (everyday language) supplemented with the terms of classical physics. This is due to, that he regards the concepts of classical physics as a more explicit formulation of everyday language. In that sense everyday language is a necessary precondition for all natural scientific realization, and nor can everyday language be replaced by an unambiguous and formalised, logical scientific language. Surpringly, Tolkien shares this idea. Remember: The two magics have a number of things in common or (when misused) evil. Technology becomes evil when it is turned from a means to an end (when it is turned into ideology). Fantasy becomes evil when it is turned into a create-your-own-reality philosophy (New Age especially, but on the whole the so-called self-production thesis). The ability to distinguish between reality and fantasy, between objective and subjective reality, is the first mark of sanity, and the confusion of the two is the first and most basic mark of insanity. Neither materialism nor idealism have the ability to discriminate. In order to establish unambiguous description (and thinking) one must be able to discriminate between subject and object, dream and reality, etc. Middle-earth is a fantasy, but paradoxically enough it is a cosmos that is more real because it is more awake. Enchantment would not be possible if you couldn´t discriminate between dream and reality. Enchantment is precisely enchanting because of the sense of something real; that is: something you haven´t produced yourself. My professor in philosophy, the late David Favrholdt, has developed this important theme in Bohr´s epistemology further in his own philosophy. He works with, what he calls The Core in everyday language. I have explained this topic in my free Ebook Philosophical Counseling with Tolkien, chapter 5, Epistemology, part 4, The Core – Rediscovering Truth. I will just shortly say that The Core involves, not an ontological dualism like Descartes´, but an epistemological, a so-called gnoseological dualism. Unambiguous description has the distinction between subject and object as a necessary precondition. And the fact itself, that we have to discriminate between subject and object in order to communicate unambiguous, actually indicates logically, that both materialism (the scientific bias) and idealism (the New Age bias) are mistaken point of views. And finally, to the concept of consciousness itself. In Japanese and Chinese philosophy, Hara (in Chinese Tan Tien) is the center of awareness. The Heart is the centre of consciousness. Both Hara and Heart have to do with space, or spaciousness, love, as we will see later. In science it is inexplicable what an ”I” or a ”Self” is. I wake up in the morning, and I know, that I am the same as yesterday or ten years ago, in spite of the fact that my body since then has changed look and that the content of my thoughts in many ways has become something else. What is this ”Me”? It is not my body, because then I should each morning go out in the bathroom and look in the mirror, in order to find out who I am. Nor is it the content of my consciousness, my thoughts and my memories, because then I first had to evoke a line of memories each morning, before I knew who I am. The whole of the total science has no explanation of, what a ”Self” is, or what personal identity is. In this there also lies another factor, namely the question about the free will, the possibility of Man consciously to decide on his own present condition and within some limits to make a free choice. Meanwhile I mean, that the concept of free will and free choice is unfortunate concepts. In my understanding the will is the will to power, and belongs to the Ego, which makes it´s choices on background of the past, and which therefore is determined by both its personal and collective history. Therefore the Ego always strives towards being something else than what it is, it imitates others, are a slave of others ideas and ideals, and its actions are charaterized by irresoluteness and doubt. A more fortunate concept would in my understanding be the freedom that lies in the existential concept of being yourself; that is: where you live in accordance with your own essence and thereby achieve authenticity, autonomy, decisiveness and power of action. I would therefore prefer to use the concepts of freedom of action and freedom of decisiveness (In Philosophical Counseling with Tolkien I have investigated the concept of free will in chapter 2, Philosophical Theology, part 2: Divine Providence and Free Will). The assertion that Man is nothing else than a product of heredity and environment, has become an ideology, a part of the planlessness of our welfare society, where no one is responsible, where no one can help anything, where everything is to blame the genes or the society. However facing this reductionism you can place a more true understanding, which has science on its side: Man is a product of heredity and environment, yes, but also of your own consciousness about yourself. I am born with some specific genes, which to a high degree put limits for, what I am able to and not able to. In some ways I have had good growing up conditions, in others bad. But I have since my childhood been conscious about myself and my surroundings, and have more or less freely been able to decide on something, rather than something else, within some limits. So therefore I am not only a product of heredity and environment, but also a person, which has become what I am, due to a line of decisions, which I have made through life. It is a viewpoint between two extremes. On the one hand we have the assertion, that no one can help, that he is as he is. No one is able to change himself. My answer is: yes, you can. You can within some given limits work with yourself, and consciously decide to reflect and meditate over your background, your past, your environment, the whole of your character. You can decide to start a spiritual practice, which you know in longer term will change your outlook and way of being. In a spiritual practice you can change yourself quite considerably. On the other hand we have Sartre´s assertion about, that a person’s life is determined alone by all the choices, he makes; that is to say: by the evaluations, which the inner thinker makes by saying yes and no, justifying and condemning, accepting and denying. But this is an overstatement, which sounds a bit too much of ”everyone is the architect of his own fortunes”. Moreover, there is the problem with the Ego and its thought distortions. It is therefore not true, that freedom lies in choosing to become what you want to. You can for example without guilt become beaten down by an assailant, so that you have to spend the rest of your life in a wheelchair. Here it is so so with being the architect of your own fortunes. Truth lies in the middle of these extremes. Heredity and environment put some limits for, what we can do and not can do. But our self and our consciousness, which scientifically seen can´t be explained alone from heredity and environment, makes us capable runningly to decide on, how we want to react in a lot of the situations, life puts us in. Therefore you can in some situations talk about a personal responsibility. It is from this mysterious consciousness that all philosophical questions come: Who am I? Where do the thoughts come from? What is consciousness and where does it come from? Is there a meaning of life? How does man preserve peace of mind and balance in all the relationships of life? How do we learn to appreciate the true goods and flout all transient and vain goals? Is the destiny of Man part of a larger plan? I have suggested, that a human being seems to have two aspects: an energy-aspect and a consciousness-aspect. Seen from the energy-aspect lawfulness rules: your body is subject to the physical laws of nature (both classical laws and quantum laws); your psychic system is subject to the lawfulness of the energy fields and of the energy transformations: compensatory karma. The psychic system is what I refer to when I talk about thoughts and mind. Seen from the consciousness-aspect, then a human being seems to be akin to the Wholeness, to be transcendent in relation to these lawfulnesses (also the quantum laws). The Wholeness is one and the same as reality. So, in my view, consciousness, Wholeness and reality is one and the same. Please give this a moment for reflection. Awareness seems to be a quality of the now, and therefore a quality of life itself: nature, Universe. 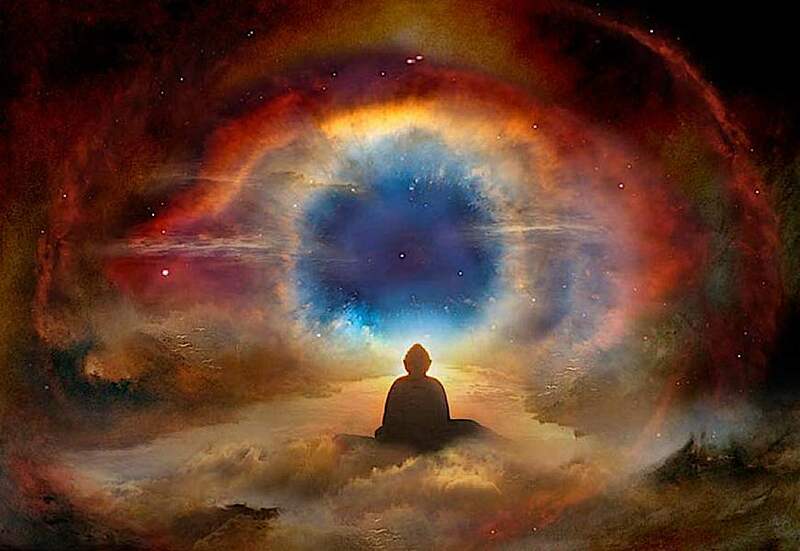 Many ancient Indian scripts say that the Universe is in meditation, or rather: the Universe is one great meditation! When you are in the Now, life, nature and universe expands. Awareness seems to have the qualities of openness and spaciousness. Unawareness closes these qualities. We can all experience this quite easily. Take a walk in the forest. Unawareness, or distractedness (focus on thinking and head), cause that we don´t see the nature we are walking in. Or take the experience of waking up from a dream and realizing it was just a dream. The reason why you can realize this is the spaciousness, which is one and the same as reality. You know that what you in the waking state experience isn´t something going on inside your head but is all around you. The concept of spaciousness (which is unknown in Western philosophy) solves in this way the so-called problem of the external world, a problem limited to Western philosophy, which only are accepting two ways of attaining knowledge: sensation and reason (thinking), and are describing consciousness as if it was a camera inside a box (if you think this sounds primitive, you´re right - Western philosophy is light years behind Eastern philosophy in that respect). You could call it the consciousness-in-a-box philosophy. It is without doubt one of the causes of the top-heavy Indo-European way of thinking, which makes the energy-image of Westerners look like that of a reverse cone. Descartes, for example, argues that since it is possible to doubt that physical bodies exist, an argument must be given to prove that they exist. All of these considerations make up what is called the problem of the external world. Descartes argues that the external world is known to exist because we have clear and distinct perceptions of it. If our perceptions were false, that would indicate that their efficient cause: God, was a deceiver. Since deception cannot logically be present in God, our perceptions are true, and there is, in fact, an external world. Descartes is the main philosopher, besides subjective idealists like George Berkeley, who is standing behind the concept of the brain-in-jar hypothesis and later the simulation theory. David Hume, dean of the empiricists, continues in the same consciousness-in-a-box style, and claims neutrality on the problem, writing that all we have before our minds are ideas, and we have no way of knowing whether our ideas correspond to an external reality. Emmanuel Kant, self-proclaimed reconciler of rationalism and empiricism, argues that there is an external world of things-in-themselves, but we are forever cut off from it because our sensory system can provide us only with phenomena that we cannot assume deliver us the qualities of the noumena. We are a consciousness in a box. The problem of the existence of the external world is one of Western epistemology’s most vexing and important questions, as it highlights the fault lines between rationalists and empiricists. They have never considered the much deeper philosophy of the East. The concept of the consciousness´ spaciousness also solves some aspects of philosophy of life, such as unhappiness and happiness. In my book a Portrait of a Lifeartist, I list six fundamental steps in art of life, where the first step is unhappiness and the last step is happiness. The four steps in between are the process of meditation, or the spiritual practice, which leads to happiness. These four steps are completely unknown in Western philosophy. The first step is called the separation of the observer and the observed. This is where Western philosophy is situated, cemented in the problem of the external world. A life, which is without any kind of spiritual practice, means that you don´t have your thinking with you in your way of life. Such a life is characterized by an existential fall. This fall consists in the experience of anxiety, a lack of ability to hold truth, Wholeness and reality. The thinking is philosophical in the sense, that it is seeking happiness, truth, release, or liberation. In order to create meaning and coherence the thinking therefore linguistical produces the reality of the self-image and the world-image, the known, which originates from the images in the movement of time, which both are lying on the personal, collective and universal plane, and which flow through both humans, society, nature, and the whole of the universe. This production is an ongoing attempt to become something else than what you are; a movement in time, from past towards future, and from future back to past, and so on, in a lot of different life-cycles. It is the eternal recurrence of the same, which manifests as symbols, memories, conceptions, ideas, images. In these the thinking has its norms and values, ideals and experiences. And in order to understand, the thinking tends towards division of these images: logical analyzing in the one as different from the other, emotional evaluating in likes and dislikes, esthetical separating in beautiful and ugly, ethical in good and evil, religious in holy and profane, sexually in gender. Finally it cognitional separates reality in the observer and the observed, whereby there is created a discrepancy where emptiness and loss slide in between, creating reflections, displacement and darkness. Therewith is created unreality and absence, a condition where there is an inner spectator, calculator or doubter (the Ego), which places itself outside, either the individual, or the surroundings. It is a condition where you experience yourself as locked inside, or locked off from, and where you feel homeless and without belongings. It is an activity of the will to power. The illusion and the self-deception in this activity are, that it is a kind of intellectual secureness or safety, which is created on the background of an escape from the anxiety, or from what you are, and this is precisely the cause of the separation between the observer and the observed, which increases the anxiety. It is a vicious circle. The French philosopher Albert Camus´ small novel The Stranger is a description of this existential emptiness, or unreality. In Algeria lives a young man, Meursault, who only is a spectator to his own life, and to the world. The whole “coherence” in his life breaks together, when his mother dies: the conventions, norms and moral. Until then he had lived a quite ordinary life. But after his mother´s death he one day, after a moment´s impulse, kills a human being he doesn´t know at all. Everything, which is happening around him, he experiences in a strange somnabulistic way without really understanding the meaning with it – or with himself – or with the world. Is he a psychological case? Or do we all know the feeling of being strangers in existence? Had he, until his mother´s death, just been subject to the same automation as most people? He doesn´t ask any philosophical questions, he is just a spectator, therefore he only lives in two dimensions: a superficial dominated by conventions, norms and moral – but beneath this automatic life existence shows its cruel face in form of the meaningless and absurd. And it is this cruel face he experiences after his mother´s death. A condition he in the end is accepting, bacause he hasn´t got any philosophical life-practice. It is a nihilistic moment that reminds about the moment in spiritual practice, where all images and ideas are leaving the mind, the creative emptiness. And in this accept he therefore experiences some kind of happiness, but it is not the spiritual happiness, it is without realization and compassion. It reminds about it, but it is not the same. In spiritual respect it is still unhappiness, illusion, the separation of the observer and the observed. In Dante´s Divine Comedy this is the same as Hell. In Indian and Buddhist philosophy it is called Samsara, the circulation of rebirth, which is characterized by pain, unhappiness, longing etc. The central aspects of this existential unhappiness are that consciousness is identified with the body and the mind, and has lost its own original spaciousness. The last step in art of life is called the wholeness of the observer and the observed, where consciousness has rediscovered its own original spaciousness. Is what we refer to as the mystical experience. It consists in, that the observer is one with the observed, so that everything only is the movement in the state of experience. You are self-forgetful open for, and engaged in life itself, the observed. Your life has become real and present. The happy life is the real, so that the individual fully and entirely exists, and the important is present. Fully and entirely to exist means, that there isn´t any dreamer, any spectator, any doubter within yourself. You are your activity. The real life is characterised by a devotion, which creates that coherence in life, where you are drawn into, and are melting into, a unified Wholeness, that contains middle, fullness and light. Your being is one with reality and truth. Patanjali called the wholeness of the observer and the observed Samadhi, the unity of consciousness with its object, or the complete fall of the consciousness into the higher itself, the unification with the absolute. In Zen Buddhism it is called Satori, and in Buddhist philosophy Nirvana. The Wholeness of the observer and the observed can happen in glimpses, and it can be a permanent condition. Mystics, such as Teresa and Eckhart, called the by glimpses condition Illuminatio, in which the soul and God in a single moment is one. That permanent to be one with God they called Unio Mystica. The same is Dante describing when he finally arrives in Paradise. In the four steps between unhappiness and happiness, and when the mind is in meditation, the consciousness is slowly attaining what the Danish philosopher and spiritual teacher, Jes Bertelsen, is calling bidirectional consciousness. In other words: Matter (hereunder the body) and mind (hereunder thoughts, the unconscious, the psyche, subject, the content of consciousness) – are something else than consciousness itself. If I should try to characterize this theory in traditional philosophy of mind, it would be a kind of double-aspect theory. The double-aspect theory is a type of mind-body monism. According to double-aspect theory, the mental and the material are different aspects or attributes of a unitary reality, which itself is neither mental nor material (so this is neither a materialist, nor an idealist, metaphysical theory, seen I the light of Western philosophy). The unitary reality is the form of consciousness, an aspect which is completely neglected in traditional Western philosophy, but very commonly known in mysticism and Eastern philosophy. In Western philosophy they have only contemplated the content of consciousness, and not the form (though Kant was very close to it with his concept of The Transcendental Apperception, the unity where the self and the world come together). They haven´t looked into the consciousness itself (the primary presence, the first-personal perspective), as you do in meditation, but only followed its direction towards an object; what you call the intentionality of consciousness (and therefore they also treat consciousness from a third-personal perspective). In fact, they claim that consciousness always must have intentionality. But this is only what I refer to as the mind. Intentionality is the power of the mind to be about, to represent, or to stand for, things, properties and states of affairs. Meditation stops the intentionality, and directs the mind into its source, namely consciousness itself, which is one and the same as reality and Wholeness (it is therefore not introspection in the sense of following the contents of mind). You could also say that meditation changes the consciousness from being one-directional to being bidirectional. Bidirectional consciousness means that the consciousness both is directed towards its form and its content. It is being open to the form of consciousness, aware of both magnetic poles in the field of subject-object experience. I have also called this the wholeness of the observer and the observed. In his book Bevidstheden Flydende lys (The Flowing Light of Consciousness), Jes Bertelsen has made a fascinating comparison between Kant and the Tibetan Dzogchen master Longchenpa, because where Kant´s philosophy stops with the transcendental apperception, Longchenpa´s philosophy begins. Where Kant´s philosophy goes in the direction of the content of consciousness, and describes the categories of experience, Longchenpa´s philosophy goes in the direction of the form of consciousness, and describes the categories of enlightenment. Kant doesn´t mention the enlightened state. Longchenpa doesn´t mention the content of consciousness. Bertelsen writes, that Tibetan Buddhism in fact has a name for Kant´s transcendental apperception; it is called Rigpa, the knowing of the original wakefulness that is personal experience. So, according to Bertelsen, Kant and Longchenpa have the same starting point: the transcendental apperception, but go in two different directions. Together they could form the complete philosophy of the bidirectional consciousness: a mandala of the cosmos. The ordinary mind, the feeling of identity, is deposited around the source of consciousness. In the cinema you can look at the screen, and lose yourself in identification with the action. And you can turn around, and look into the lightsource of the projector. In the mind the projector is hidden in the Ego, hidden in the thinking, hidden in the awareness. In order to discover and break the identification with the samsarical producer of the ordinary mind, the subject must discover the hidden source in the awareness or in the innermost of consciousness. It happens by neutralizing the Ego´s, or the thinking´s, functions. This happens through meditation. The source of awareness, the naked consciousness, is hidden because it has melted together with these four functions. They have become a kind of layers. This is furthermore accentuated by the identification with the body, hereunder the emotional painbody, which not only contains pain from your personal history, but also from the more collective history. The layers of the painbody consist of self; past lives; immediate family systems; ancestral patterns; world, global and cosmic patterns; ego death; understanding and releasing thoughtforms; personal and collective shadow; genetics and heredity; cosmic consciousness, etc. The painbody contains what the West has called original sin and what the East has called negative karma. The whole process is like a flower opening itself. I see materialism and idealism as complementary to each other, because they mutually exclude each other and at the same time necessarily must supplement each other. It is this which comes to expression in the necessity of an epistemological dualism in order to reach unambiguous thinking and description. But this is not an ontological dualism like Descartes´. The double-aspect theory avoids the mind-body dualism, which claims that the mind and body are completely distinct and separable. The dual-aspect monism has the very specific further feature, namely that different aspects may show a complementarity in a quantum physical sense. This implies that with regard to mental and physical states there may be incompatible descriptions of different parts that emerge from the Wholeness. This stands in close analogy to quantum physics, where complementary properties cannot be determined jointly with accuracy. And the form of consciousness, the unitary reality, the Wholeness, is itself neither mental nor material. It is Tao (God), the undescribable. If one should describe it, it could be decribed as divine because the lifefulfilment, which life itself contains, is so absolute, so complete, that there herein is something eternal and endless. If you are present in the Now, actively and involved from the awareness (the Soul), the innermost in yourself, and from the heartfulness - that is to say: totally, with the whole of yourself, and therefore in self-forgetful freedom and world absorption - then you will experience eternity and infinity. You will experience the true essence of nature, which is God. Furthermore: the consciousness-aspect is also the area of progressive karma (divine providence): the dreaming tracks and songlines in the artwork of the universe and Man. Progressive karma lies in the transcendental apperception, or rigpa: the transcendental unity of all experience. It is also called the great vision, from which the Universe is created. I see the concept of a transcendental aspect, and the use of words such as God, the Divine, the Otherness, etc., as necessary concepts due to the threat of subjectivism and therefore ego-inflation. The Buddhist philosopher Nagarjuna claimed, that the Now´s lawfulness around the function of a universal negationpower (the negation of the Wholeness), is due to, that energy works as streams and dividings within the superior Wholeness. And because the Wholeness is a reality, each part will always fit into a correspondent part. This means, that each part only can be understood in relation to its negation; that is: what the part not is. Firstly this implies, that each part comes to appear as part of a polarization-pair, or a pair of opposites – like in the teaching of Yin and Yang - or seen as complementary as in quantum mechanics. Secondly it implies, that each part only can be understood in relation to everything else; that is: in relation to the Wholeness. So the more you, through the Ego´s evaluations, isolate these parts from each other, the more the abandoned parts will work stronger and stronger on their polar partners. Therefore these polar partners in their extremes will finally switch over in the opposite extreme. Another aspect of this lawfulness, or another way to describe this lawfulness is: energy returns to its starting point. This is also called compensatory karma, and the lawfulness works as wave movements and pendulum movements. Herewith we can talk about the laws of the Wholeness. These are known in all wisdom traditions: Tao, Dharma, Destiny, Karma, Hybris-nemesis, Original sin, Logos, the Will of God, and so on. They say as follows: energy returns to it´s starting point. You may therefore say, that energy moves as a wheel. Thus it is these laws, which control all the different life-cycles. The progressive karma, the dreaming tracks and the songlines, is the map of the Wholeness. It is the map which shows the consciousness it´s direction back to its source, namely the Wholeness. This map can therefore only be experienced in meditation, in neutral observation and bidirectional consciousness. You can´t experience it in a psychedelic trip, since the bidirectional consciousness only can be created through a long and vegetative meditative work. A work that can be compared with the work of changing the light beam of a projector in a movie theatre, and re-directing it into the projector itself. Or like changing the direction of a river. A psychedelic trip will just enforce the one-directional mind. As the psychedelic therapists say: just flow with it. No! I say, don´t just flow with it, work with re-directing a part of it into its own source! First here the glimpses of the Wholeness begins. Seen from the consciousness-aspect, then a human being seems to be akin to the Wholeness, to be transcendent in relation to these lawfulnesses (also the quantum laws). The Wholeness is one and the same as reality. So, in my view, consciousness, Wholeness and reality is one and the same. This transcendent aspect is a negation of everything we can describe. We can only describe something in relation to its opposition. The Wholeness can´t be put in opposition to anything, therefore it is undescribable. A theory of everything is impossible. So-called “holistic, or nondual theories” are self-contradictory and self-refuting. This concept of indescribable transcendence also exists within Hindu and Buddhist theology. In the East, however, this relationship is viewed slightly differently: that which is absolute transcendent of all knowledge is the basis of your own being. It is you; it is immanent within you. This fundamental Oriental statement appears in the Chhândogya Upanishad as early as the eighth century B.C: Tat Tvam Asi, “Thou art that.” You yourself are that which you would know. However this “you” is not the you that you identify with, not this phenomenon in time and space that can be named, that can be identified, that can be described. Therefore the importance of self-abnegation, or negation as such, as this is happening in meditation. That is not it, and so we also have the Sanskrit phrase, Neti, Neti – “not this, not this!” Anything that you can name about yourself is not it. Therefore, when you have erased all that you can name and broken through, then you have come to it. This is a very different calculus. In this equation, a is you and x is the mystery and a = x – you are that mystery, but not the “you” that you think you are. The you that you think you are is not it and you that you can´t even think about is it. This paradox, this absurdity, is the essential mystery of the East. At first glimpse it could sound like solipsism, but the further you inquire into, it is the direct opposite. In the preparatory practice the balloon of the ordinary mind´s solipsism is punctured. The negation-principle furthermore implies a complementarity feature, namely that different aspects within the Wholeness may show a complementarity. It implies that with regard to mental and physical states there may be incompatible descriptions of different parts that emerge from the whole. This stands in close analogy to quantum physics, where complementary properties cannot be determined jointly with accuracy. You can say that two descriptions are complementary if they mutually exclude each other, yet are both necessary to describe a situation exhaustively. With the spaciousness of consciousness, as well as the negation-principle, we come to the ethical aspects of consciousness. The ethical element comes in since we must presume that other people also have a primary presence, which is a negation of both matter and mind. Ethics or moral philosophy is a branch of philosophy that involves systematizing, defending, and recommending concepts of right and wrong conduct. The branch of philosophy axiology comprises the sub-branches of ethics and aesthetics, each concerned with values. Ethics seeks to resolve questions of human morality by defining concepts such as good and evil, right and wrong, virtue and vice, justice and crime. As a field of intellectual enquiry, moral philosophy also is related to the fields of moral psychology, descriptive ethics, and value theory. 1) Meta-ethics, concerning the theoretical meaning and reference of moral propositions, and how their truth values (if any) can be determined. 2) Normative ethics, concerning the practical means of determining a moral course of action. 3) Applied ethics, concerning what a person is obligated (or permitted) to do in a specific situation or a particular domain of action. In the previous we have focused on the war between the Wholeness and reductionism and in ethics this continues as the war between moral absolutism and moral relativism. Ethics is certainly the most practically important division of philosophy, and the one most people think of first. But the most important part of ethics is not the one most people think of first. It is not the ethics of anything but the foundations of ethics. Foundations are the most important part of any building, as roots to a tree. We thus first turn to what might be called “the metaphysical foundations of morality”. Morality is like the marching orders in the war between good and evil. Tolkien strongly side with the traditional “natural order law” view that this war, this distinction, and this goodness are objectively real. But is evil also objectively real, and, if so, is it equally real and equally powerful compared to good? The Indian philosophy claims, that the movement of time in itself is a negation-power (Asat, Avidya, or Shabda-Brahman, the self-sacrifice). In Christian terms this would be called Logos or the Christ principle. Time is one great negation (self-sacrifice) of the Now´s unmoved being (Atman), which is the unmanifested, the actual source: the Good, the True and the Beautiful. Or said in Indian terms: a sacrifice of pure being (Sat) pure consciousness (chit) and pure joy (ananda). In this way, the future arises, and an outgoing creative movement; a movement, which can be compared with what they within science call The Big Bang (but it is not the same). In the outgoing movement, the great vision becomes, because of the negation-power, shattered in many images, which now become a kind of memories about the great vision. Hereby the manifested world is created and with this, the ego. In this way, the past arises, and a longing back towards the origin, the unmanifested. And then a destructive backmovement is created. In that way, the movement of time consists of two universal movements, which we could call the outgoing movement and the backmovement. Future and past, creation and destruction. These two movements are reflected throughout the universe in a multiplicity of different lifecycles; they are Samsara´s wheel of up-cycles which are followed by down-cycles and vice versa (for example life and death, success and fiasco, joy and sorrow) – all this which lie behind the law of karma and rebirth. In Western theology: original sin. So the images in the movement of time are shattered reflections of the great vision of the universe. Because of the negation-power the images in time are coming only to exist in relation to their negation. For example, images of the powerful, the perfect and the good, only exist in relation to the powerlessness, the fiasco and the evil. So, all images contain a structure of opposites. The most universal images include their polar partners, they are a kind of visionary mandala-structures or yantrafields. The more collective and personal images expel their polar partners. However, this is in accordance with the logic of the images not possible, and the result is contradiction and division (suffering). So, consciousness is accentuated by spaciousness and the negation-principle, and with this we have a metaphysical foundation of ethics. Because we must presume that other people have a primary presence, and that this also is accentuated by spaciousness and a negation of both matter and mind. The logic of the negation-principle lets the other human being escape one´s own prejudices, images and ideas. And this is the beginning of ethics. To repeat: the movement of time in itself is a negation-power (Asat, Avidya, or Shabda-Brahman, the self-sacrifice), and that this in Christian terms would be called Logos or the Christ principle. Time is one great negation (self-sacrifice) of the Now´s unmoved being (Atman). Quite central in Krishnamurti´s teaching is the concept of self-abnegation. He refers to the nondual enlightened consciousness as an absolute Otherness, which the ordinary mind and its thinking never can know, wherefore the ordinary mind, thinking, will, etc., must stop completely. The ethical aspects of this can be clarified by comparing it with the Jewish philosopher Emmanuel Lévinas. In Totality and Infinity: An Essay on Exteriority (1961), Lévinas has some ideas strikingly similar to Krishnamurti (Krishnamurti didn´t know Levinas, and I guess that Levinas didn´t know Krishnamurti either). Levinas said that previous philosophy had reduced the Other person to an object of consciousness, by not preserving its absolute alterity—the innate condition of otherness, by which the Other radically transcends the Self and the totality of the human network into which the Other is being placed. As a challenge to self-assurance, the existence of the Other is a matter of ethics, because the ethical priority of the Other equals the primacy of ethics over ontology in real life. “The others that obsess me in the Other do not affect me as examples of the same genus united with my neighbor, by resemblance or common nature, individuations of the human race, or chips off the old block ... The others concern me from the first. Here, fraternity precedes the commonness of a genus. My relationship with the Other as neighbor gives meaning to my relations with all the others.” (Otherwise than Being or Beyond Essence (1974), p. 159). Martin Buber said: ”By the Thou am I created. As I am created, I say Thou. All real life is meeting”. Man is a communicative being. Central in Buber´s thinking is the thought about two fundamental relationships: I-THOU and I-IT. He has investigated this in his wonderful poetic book I and Thou. The I-Thou relationship is characterised by freedom, co-operation and a deep feeling of personal involvement. The I confronts its Thou, not as something, which can be studied, be measured or manipulated, but as a unique presence, which is answering the I in its individuality. This corresponds to the communicative view of Man and nature. It is an acknowledgement of the first-person perspective in Man, and that all men have this primary first-person perspective. The I-It relationship is characterised by a tendency to treat something as an impersonal object controlled by causal, social or economical powers. This corresponds to the instrumental view of Man and nature, and it is the third-person perspective on consciousness. Buber refuses the idea about that humans are isolated, autonomous beings, who act from abstract rules. Instead the reality exists between humans as they discover and change each other. Reality is shortly said dialogical in its nature. Buber describes God as the eternal THOU, the Thou, who never can be an IT. In that way you can reach God, not with a derivation or a conclusion (some images of life), but with a readiness to answer the concrete reality of the divine presence. In accordance with Buber, then Man, in this way, can relate to life in two radical different ways: either as a subject who experiences something, namely an object, an It, which he is standing outside. Or as a person who is in the relationship with another person, a Thou. It is the last, which is fundamental. The “I” first becomes an ”I” in this relationship with a ”Thou”. There exists no “I” in and with itself. The basic purpose in the human existence is the actual relationship. The spirit, the human reality, is not in the “I” (as New Age and personal development claim), but between I and Thou. First in this between is Man´s way of being constituted. The relationship with the Thou is in this way the mirror in which the “I” can discover itself. The relationship is a philosophical sparring partner. It is for instance Martin Buber´s intention to show, that we can communicate on a much deeper plane; that is: not only linguistically, but in solidarity, where two parts meet on the same plane with the same intensity, with the same passion; only then there is real solidarity, and that is much more important than sheer communication. In his essay Healing through Meeting Buber claims, that in the spontaneity, which is present when one human is facing another, the reserve, which characterizes an isolated ego, is being broken and changed. A healing relationship can function opening on humans, who are sick in their relationship with the Otherness. But there is no knowledge about, or method, for the true meeting in Buber´s dialogical relationship; it happens, it is something, which is coming by itself. True dialogue and meeting are not dependent on a certain routine, time or location. The solidarity it creates, you can also call the spirit in the human reality. In this way we have the metaphysical foundations for morality. We must work our way back towards the great vision. In that way we are on a Quest, a Pilgrimage. The Return of the Sophists.